Our Disney Cruise, Part 1: A List of "The Little Things"
I know most of you knew that we took a Disney cruise about 2 weeks ago. And perhaps you were wondering why I wasn’t writing about it? It’s because I had promised GeekMom.com several posts about our trip and I wanted to get those posts out there first. It’s easy enough now to translate the text over to my own blog, which I’m going to do now. I’ve drafted 7 posts about the cruise, and they aren’t the normal “Here’s how our cruise was” type of posts. Enjoy! 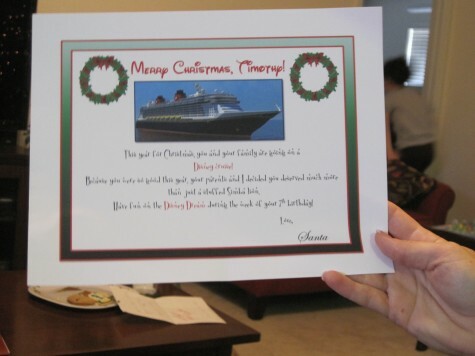 Santa brought the family a 4-night Disney cruise vacation this year! The trip happened to coincide with Timmy’s birthday. In a very uncharacteristic move, Dave and I agreed to take the boys out of school for a solid week and drove out to Port Canaveral, Florida, the homeport to the Disney Dream, Disney Cruise Line’s most-recently christened* ship. Learn more about Disney Cruise Lines through their website. Check out Wikipedia for the Disney Dream‘s amazing statistics. Or better yet, how about the Disney Dream by the Numbers? Our sons unwrapped big boxes with these certificates inside on Christmas morning. I don’t plan to discuss too much about the cruise itself. Anyone can write about taking a cruise, right? We stopped in Nassau, Bahamas and on Disney’s private island, Castaway Cay. Our sons got to experience snorkeling for the first time. I’ve cruised with Carnival in the past, but that didn’t hold a candle to last week’s trip! My family was geeking-out at some of the amazing little subtleties that make the Disney Cruise Line experience second-to-none! It goes without saying that the “Hidden Mickeys” are everywhere. This one isn’t quite so hidden, though. Obviously there are Disney characters on a Disney cruise, right? 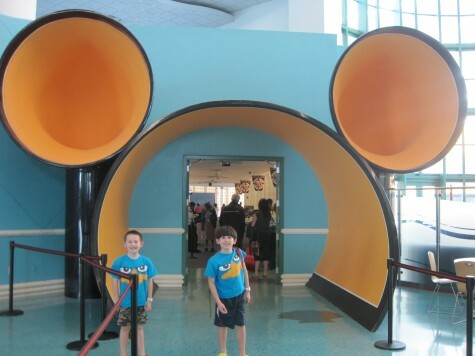 After having experienced many hours in line over the years waiting to meet Mickey, Minnie, Pooh Bear, Rafiki, Buzz Lightyear and Mr. Frederickson at Walt Disney World, it was a breath of fresh air to not have to wait long for characters at all. My sons filled up their autograph book on a family trip to Disneyworld in 2009, so they were rather lassiez-faire about the characters this time around. In fact, we only waited in line for ONE character: Jack Sparrow! Most of the others we encountered almost by chance throughout the cruise ship. 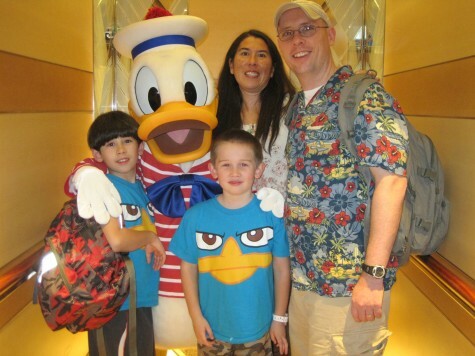 When your very first elevator ride to your stateroom is with Donald Duck, the bar has been set pretty high. Like other cruise lines, many things are tied in to the key card. Disney calls their card the “Key to the World“, whether you’re on the cruise or staying at a Disney resort on land. If you are combining a cruise with a Walt Disney World vacation, the same card will have your resort key, park tickets and Disney Dining Plan information loaded onto it. 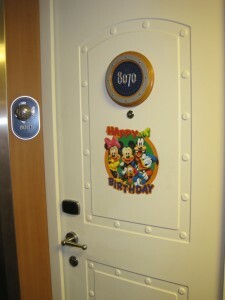 On the Disney Dream, we used the key card to enter our stateroom, turn on the lights, enter/exit the ship at ports of call, tie into a photography account when the onboard photographers take snapshots, drop off/pick up your children from the Oceaneer’s Club, and charge beverages and souvenirs. The Disney Dream is so new that instead of swiping the key card in many places, we instead had a touch pad. Similar to MasterCard PayPass touch pads. To enter/exit our staterooms, the kids didn’t even have to remove the keycards from their lanyards. Just touch the card to the pad. We used similar touch pads for entering/exiting the ship. The little black keypad above the door handle is a touch pad for the key card. The kids didn’t have to pull their cards out of their lanyard pockets to open/close the door! Another thing the key card is used for is to control the electricity in your stateroom. I found this a great energy-conservation tool. There was a slot near the front door for the key card. A card needed to be in the slot before lights or the television could be turned on. I discovered that it didn’t matter what card was used for the switch — I’m guessing it was a manual connection switch in the slot somewhere. 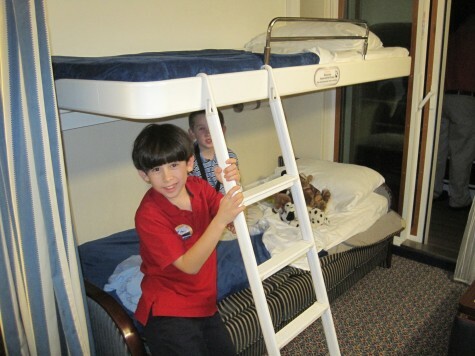 I saw a stateroom host using a Sleep Inn keycard while cleaning a nearby stateroom, ha ha! Using key cards to control room electricity is not new technology, I know. It’s been commonplace in hotels in Europe and Asia for years. Each child ages 3-10 who wants to participate in the Oceaneer Club or Oceaneer Lab kids’ clubs on the Disney Dream are outfitted with waterproof wristbands. Called “Mickey Bands”. These two kids’ clubs together (they’re connected) offer over 10,000 square feet of playspace, covering everything from playground space to arts and crafts to interactive play. You may fit the children for the wristbands in the cruise terminal before boarding, at the registration temporary office as soon as your board, or any time during the cruise at the Kids’ Club check-in/check-out area (which I don’t recommend because there’s often a line of parents that you tend to hold up while the attendant is printing and fitting the wristband). It seemed simple enough for the kids to tap their wrists to the gate to enter and exit. Very secure! You provide a password through the Disney website that approved adults can use to check out the kids from the secure areas. NOTE: As a safety measure, the kids club policies changed significantly starting in January 2012. Whereas previously parents could freely participate with their children at any time, now the kids’ clubs offer “Open House” and “Secured” areas. If you desire your child to be at the kids’ clubs without parents present, they have to go to the “Secured” area and no other parents are allowed in. Only DCL child care employees. If the family desires to do the kids’ club activities together they can take advantage of “Open House” periods in 2-4 hour blocks throughout the cruise. Another hidden feature of the RFID bands — the geeky part — is that in the kids’ club spaces, the wristband is transmitting what rooms you child travels to. This helps the counselors maintain their ratios and helps the parents quickly find their children when it’s pick-up time. 5.) The Automatic Hand Washing Machine! It’s an automatic hand-washing machine! Before the kids entered the Oceaneer’s Club or Oceaneer’s Lab, their forearms were dunked into this machine for 30 seconds. Washed and rinsed! Also in the kids’ club areas were these most-awesome machines. Automatic hand-washers! The kids simply stick their arms inside and the machine automatically starts. Water spirals around your hands and forearms, then soapy water, then another cycle of fresh water. All in about 25 seconds. Take out your arms and dry them off! Unlike other cruise lines, families aboard Disney Cruise Line trips are assigned the same service team for dinner dining and stateroom care throughout the entire cruise. This has both benefits and drawbacks. Of course, a benefit is that you get to know several of the cast members. This is great for the kids. We had very friendly servers and the stateroom host was a sweetheart. At the end of the cruise, you are presenting gratuities to the servers and stateroom host themselves, instead of their pooling the money. Our boys learned quite a bit about Bulgaria from our assistant server, Dimi. Dimi was relatively new and was practicing his Mickey-Mouse ears-shaped ketchup every night. One of the drawbacks is that I could imagine if someone received substandard service (which wouldn’t be tolerated for long by Disney Cruse Lines, I’d imagine), you’re left with that server for the duration. I didn’t see this, so let’s just hope this is purely hypothetical. 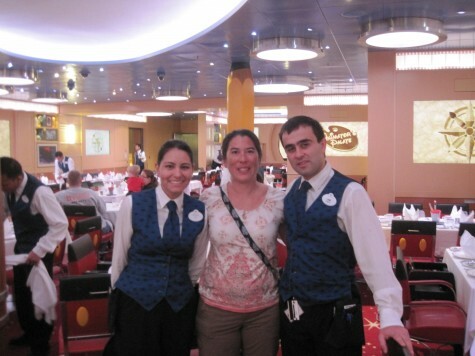 Meet Drenka from Peru and Dimi from Bulgaria, our dinnertime servers during our entire cruise. If you’re celebrating while on board, stand back! Disney gives you several opportunities to tell them whether you’re getting married (there were several weddings during our cruise), celebrating an anniversary or birthday, or on a honeymoon. Since our youngest son was celebrating his 7th birthday during the cruise, they gave him a button to wear. Cast members left and right would say “Happy Birthday” to our son as we were walking throughout the ship and on Castaway Cay. My youngest son was allowed to wear a “Happy Birthday” button during the cruise. Cast members were wishing him “Happy Birthday” constantly. 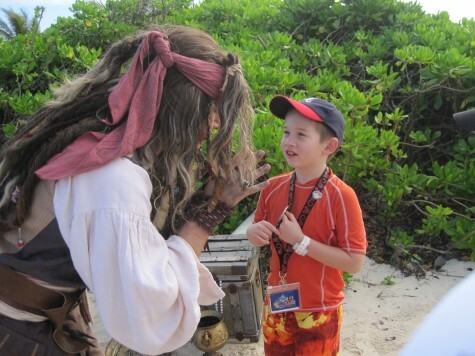 Here, Jack Sparrow is wishing him Happy Birthday. Look at that face! You can’t beat it! Are there any Disney films in theaters while you’re sailing? If so, you have several opportunities to see them during the cruise for no additional charge. I was thrilled to see Beauty and the Beast 3D being offered but I didn’t get to see any movies during the cruise. It’s tough debating what items to cut from the packed schedule. Warhorse and The Muppets were also showing. Other movies offered included The Help, Cars 2 and Pirates of the Caribbean: On Stranger Tides. Anyone who’s been on a cruise vacation knows that the stateroom host makes up your room in the morning, and then during dinner he/she comes in and performs a “turn-down service”. For our particular stateroom, this meant pulling the bunk bed down from the ceiling, laying out chocolates and leaving the kids a cool towel origami animal to enjoy. The bottom bunk is the couch with the back flipped down. The top bunk came down from the ceiling! 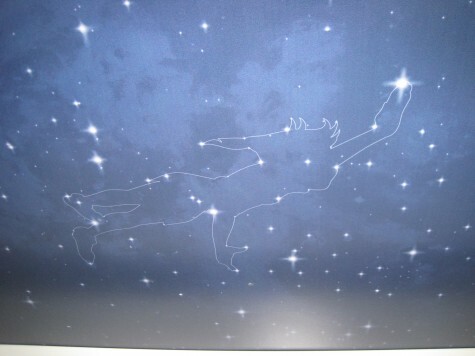 Stars and constellations of Peter Pan, Wendy and the other Darling children graced the kids’ top bunk. How adorable is this? 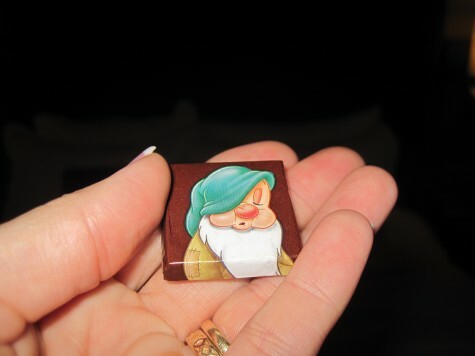 Sleepy Dwarf chocolates every night on our beds! 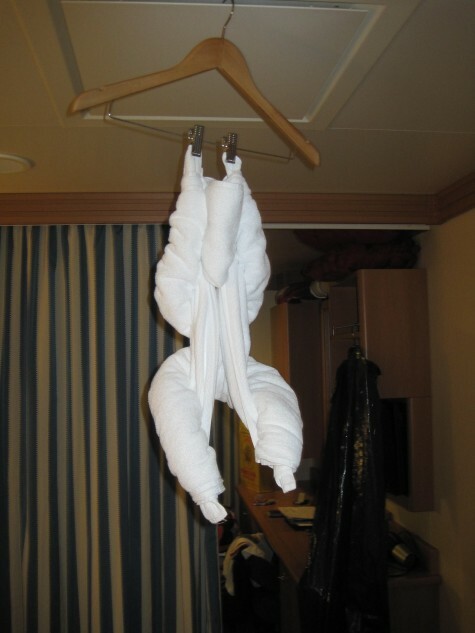 This is typical for most cruise lines: towel origami. But this is definitely the first time we had a monkey hanging from our ceiling! Stay tuned for additional posts about our family trip aboard the Disney Dream. Coming soon, the Midship Detective Agency (and other biometrics), the Animator’s Palette, AquaDuck! and the stunning Disney art on the ship. 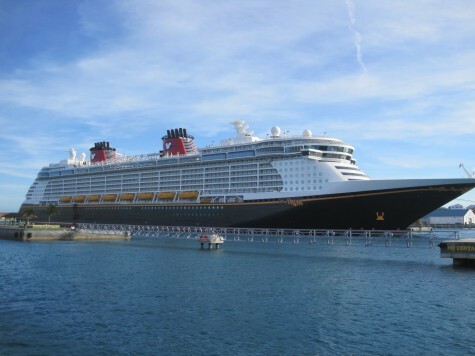 *The Disney Fantasy is currently undergoing sea trials in Europe and is scheduled for her first voyage in March 2012. Follow her upcoming journey across the Atlantic for her 28 February christening in Manhattan on Twitter.